Congrats on your pregnancy! There is so much to consider to help your child grow throughout your pregnancy. An important thing that you can do to help your child is to ensure your gums and teeth are healthy throughout your pregnancy. You are at greater risk for getting gingivitis (periodontal disease), which is related to low birth weight and a premature birth. But there's a great deal you can do in order to improve your oral health, such as seeing your dentist in Pearland, TX to get an examination and cleaning. At Highland Dental Care and Ortho., our seasoned staff works with women to improve their dental health and cope with frequent dental issues when pregnant. Keep reading to find out about the ways pregnancy might influence your mouth and how to keep your baby healthy throughout this time period. The risk for getting gum disease grows when you are pregnant. Your gums can be darker, extra sensitive, swollen, and also more likely to bleed when you floss and brush. The higher levels of hormones make it a lot easier for the germs that leads to gingivitis to flourish in your mouth. Along with being an unwanted symptom of pregnancy, nausea could be an issue for your own teeth. The acid in your stomach can harm your teeth. Following a wave of morning sickness be certain that you rinse using a mouthwash or brush. Due to hormones and also an increase in your blood circulation when pregnant, your teeth might feel a bit more sensitive. You might have a sharp pain if you eat or drink something that is particularly cold or hot. One frequent problem with women during pregnancy is dry mouth. This will make it a lot easier for cavities to develop as there's less saliva to wash bacteria away. On the other hand, a few women discover they have excessive saliva throughout their pregnancy. While you need to have been flossing all along, it's particularly important to floss during your pregnancy. Flossing once daily removes germs and debris that could be stuck in your teeth. Flossing makes it easier to prevent cavities and improve your gum health. Treat dry mouth and wash germs from your teeth by drinking water through the day. If you have fluoridated tap water (ask your town about fluoride levels in your water) this will assist in improving the strength of your teeth. Between professional cleanings at your dentist, you should be brushing at home at least two times every day using a fluoridated toothpaste. Your dentist may suggest a soft-bristled toothbrush when you are pregnant so that you may gently brush your teeth and gums. Ask your dental team to show you the correct brushing technique in your visits to be certain that you're brushing correctly. Continue seeing a dentist in Pearland, TX for dental examinations and cleanings. Make sure you inform your dental staff that you're pregnant, or once your baby is born, if you're breastfeeding. They'll take additional precautions with electronic x-rays along with other procedures to be certain they're safe you and your child. Your dentist can also suggest products, such as mouthwash or a specific toothpaste, which may aid in improving your dental health and alleviate issues, including dry mouth and gum inflammation. While it can be tough to fight cravings, do everything you can to adhere to a healthy diet. Your child's teeth will start to form during months three through six, therefore this is a fantastic time to raise your consumption of calcium and protein in addition to vitamins A, C, and D. If you do eat a sugary treat (occasionally the baby makes you! ), rinse with mouthwash or brush your teeth. Should you have to get a treatment throughout your pregnancy, such as a filling or a periodontal treatment, your dentist can help you determine if this may be safely done. Generally, dental therapies with numbing cream are ideally done in the second trimester (weeks 13 – 21). Any treatments that need sedation (oral-conscious medicine or nitrous oxide gas) ought to be delayed. Preventing treatments is a major reason to take great care of your dental health in your home. As soon as your child is born, be certain that you continue taking good care of your dental health by flossing and brushing daily. At your next trip to a dentist, inquire about making your child's first dental appointment. Your child should go to the dentist prior to their first birthday. During this visit, your dentist will track your kid's dental health and the growth of the teeth. Your dentist may also help you with concerns regarding how pacifiers and sucking on their thumb affect your kid's mouth, bottle tooth decay, as well as other common issues. At Highland Dental Care and Ortho., our skilled staff will ensure that your kid has a good initial experience with the dentist to prepare them for a life of good dental health. 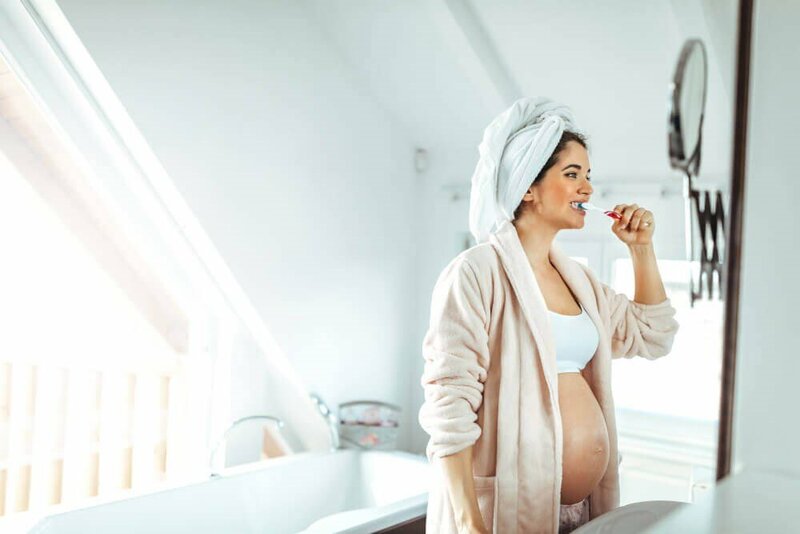 Caring for your dental health while you are pregnant will lessen your distress throughout this frequently uncomfortable time and improve your baby's development. If you are thinking about starting a family or you're already pregnant, make an appointment for an examination with your dentist in Pearland, TX to discover ways to improve or take care of the health of your gums and teeth when pregnant. Highland Dental Care and Ortho. provides compassionate care during your pregnancy and also a good experience for your entire household once your child is born.